At 7 AM artists gathered at the red Pagoda on Lake Eola. The Orlando Sentinel, a local paper had reporters out interviewing all the participants. At 10 Am we gathered at Panera Bread for breakfast and some sketchbook swapping. The Orlando Sentinel photographer remained with the group shooting photos. At 1 PM we gathered at Urban Think a local bookstore. Author John Fleming was signing copies of his book "Fearsome Creatures". At 4 PM we gathered at Eola Wine Company. Finally at 7Pm the remaining artist rat pack gathered at Stardust Lounge for a final sketch and night cap. Your brilliant, glowing, wonderful sketches tell the story of a marvellous crawl. Thank you! Do you call these "sketches"? I call them "Marvelous work". Wow - what a BIG day you had! The sketches are marvellous and the idea that sketchcrawl will be in the local paper is so exciting. When your work was seen, I became feelings to see the picture book. 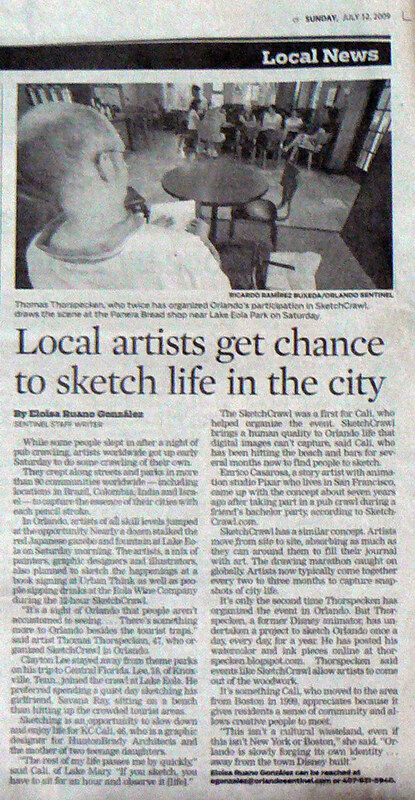 The Orlando leg of the sketch Crawl got some press. Last edited by Thorsx on Tue Jul 21, 2009 3:37 am, edited 2 times in total. Great Scenes Thorsx, I especially love your indoor scenes, the composition and poses are excellent. Congratualtions! You had a wonderful day. And thanks for sharing. I enjoyed it happily. I enjoyed joining you and the others at the Eola Wine Co. It was interesting to view the work of the talented group. Thank you for organizing such a successful crawl. Second sketch ... the seat from which I made the first sketch. This was my first experiment with watercolor pencils. Used my pinky finger to get some condensation from my water bottle then touched an area I had colored in and painted with my finger. Impressed with how easily that worked out. I am so happy you posted. I know there are tons more sketches out there so I hope folks follow your lead. My few sketches were getting lonely. Wow! great works I also feel these have picture book quality. It is nice to be seen on local news! I like your part color style So fashionable! I got downtown kind of late and had a hard time finding the group... but when I saw this tree branch that was so heavy it grew into the ground and back out again, I just had to sit down and sketch it! It's kind of unfinished, but I think I like it better that way. An extremely sketchy view of the table inside the wine shop where we finally found the group. After seeing the way Thor sketches, I tried my hand at it. Still needs some tweaking, but I think it came out rather well for a first try.